I know it's way past Halloween, but I wanted to share some pics of the masks I made for the Museum of Cultural Arts Houston Masquerade Ball. 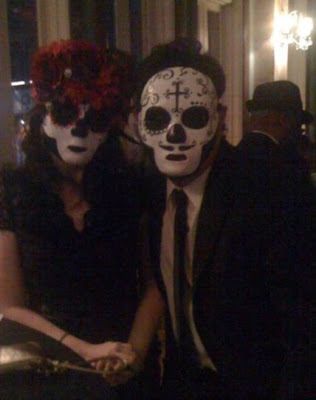 We dressed as a Dia de los Muertos couple. 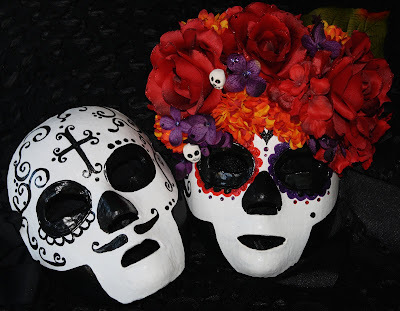 I made the masks out of papier mache and embellished mine with silk flowers and Swarovski crystals. I made the little skulls out of polymer clay. Michael's mask got just a touch of fine black glitter on the cross. I love the way they turned out. They are going to be awesome Halloween decorations next year! I love this shot because it's so dark and spooky and the background reminds me of The Shining. At the time, we thought the picture wasn't any good because we took it with an iPhone and it didn't have a flash, but I think it's awesome. Very film noir. 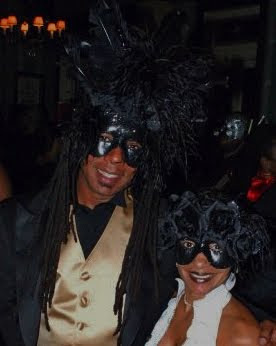 I also made these wicked awesome masks for the founders of MOCAH, Rhonda and Reginald Adams. Don't they look great? Reg is verrrrry tall and Rhonda is teeny tiny. I hit at right about his nose! Leave it to me to make a foot-tall mask that made him even taller!